"We want to federate the people" -- Front de Gauche leader Jean-Luc Melenchon. September 14, 2014 -- Green Left Weekly -- About 200 activists from France’s Front de Gauche (Left Front) gathered in Paris on September 6 to discuss the group’s future. The front has been in limbo over the past few months after disagreements about strategy led to a weak performance in the European and local council elections in May. The meeting took place at a time of controversy in French politics. The once social-democratic Socialist Party (PS) President Fancois Hollande had sacked the cabinet and appointed a new one — the second time since the start of the year — and the far-right National Front (FN) topped the presidential opinion polls for the first time. On top of this, Jean-Luc Melenchon, the leader of the Parti de Gauche (Left Party) that is one of main groups in the Left Front, stood down as Left Front co-president. Melenchon announced he would soon launch a new Movement for a Sixth Republic. This political instability is an outgrowth of a deeper economic malaise. Since Hollande’s election in 2012, the economy has stood on shaky ground. The economy has stagnated for the first two quarters of the year. 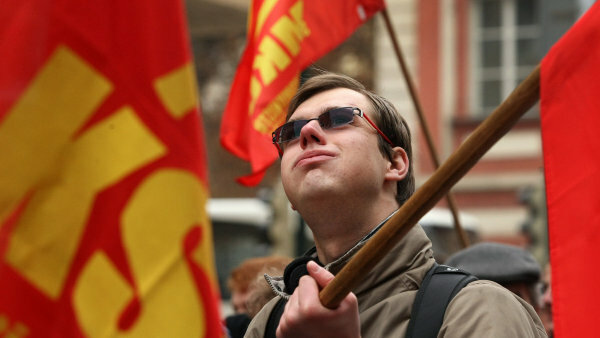 A supporter of the the Communist Party of Bohemia and Moravia (KSCM) at a party rally. Transform! Network -- Before me is the task of speaking in a limited time on things that can hardly be responsibly described in brief. For that reason please allow me to make use of a method that could be compared to tossing a flat stone along a flat surface – ever grazing the water, making a couple of little waves and flying off a little more to brush the surface again. With regards to several issues I too will merely brush the surface and rush on to others. And it is likely more questions will arise than answers. What will I be speaking about? The Karlovy Vary Film Festival has a section called: East of the West. Likewise we will devote this time to the area east of the West, though in the slightly narrower sense of the part of Central Europe otherwise known as the Visegrad Four: the Czech Republic, Slovakia, Hungary and Poland (total 106 European parliament seats – 14.1 %). August 3, 2014 -- Green Left Weekly -- The Party of the European Left is a continent-wide amalgamation of far-left, radical and socialist political parties and groups. It includes the Coalition of the Radical Left (Syriza) in Greece, Die Linke in Germany, the United Left in Spain, the Left Front (Front de Gauche) in France and many others. While attending the Ninth Summer University of European Left, Green Left Weekly's Denis Rogatyuk got a chance to discuss the challenges and plans of the European Left with Pierre Laurent, its current chairperson. Laurent is also national secretary of the French Communist Party, which is part of France’s Left Front. Denis Rogatyuk: I thought we would begin with the question on the mind of all the different left and progressive political parties in Europe — the question of the European Elections. Do you think the European Left fulfilled the best possible outcome in these elections? 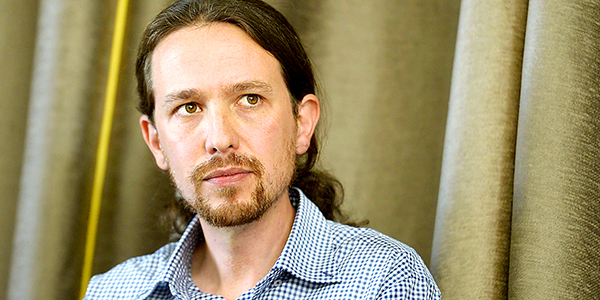 Click for more on Podemos and politics in Spain. July 15, 2014 -- Le Monde Diplomatique, translated by Revolting Europe -- In Spain, the surge of discontent caused by structural adjustment policies and hostage taking of popular sovereignty by the oligarchic powers gave rise to a series of protests and created spaces for social cooperation. However, it had no effect on the political system and its internal balance. To activate subtitles, press play and click on the bottom right icon, next to the clock. Then choose English. 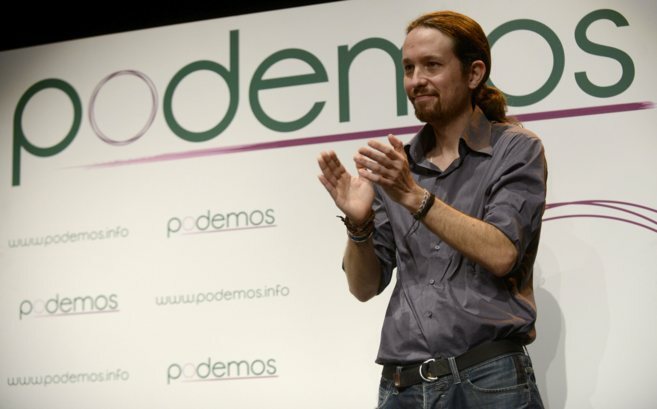 July 2, 2014 -- Links International Journal of Socialist Renewal -- Pablo Iglesias is one of the five members of the European Parliament elected from the lists of Podemos, a barely 100-day-old political party that in the May 2014 European elections won more than 1 million votes in Spain. In his maiden speech in the European Parliament, Iglesias praised the memory of the European peoples who fought for justice and freedom, and attacked the hijacking of democracy by financial markets, lobbies and big corporations. June 24, 2014 -- Transform!, posted at Links International Journal of Socialist Renewal -- Recently re-elected at the head of the GUE/NGL parliamentary group, Gabi Zimmer (from Germany's Die LINKE) delivers insights on the new GUE/NGL’s composition. It has significantly grown, numbering 52 members of the European Parliament (MEPs) in the new legislature -- up from 35 in the previous parliament. How would you assess the results for the political forces that have jointly managed European institutions since the beginning of European integration, namely the conservatives, the social-democrats and the liberals? Gabi Zimmer: The results of the European elections are very ambivalent. On the one hand, we have to acknowledge that there is a slim majority for the conservatives. MEPs from the European Popular Party will most likely form a sort of great coalition with the social democrats and the liberals. But on the other hand, this does not reflect the wishes of the people for another policy. The results showed that they want the European Union to change, and its policies to go in another direction. Moreover, it is not possible to talk about the outcomes of the European elections without mentioning the results of extreme right and nationalist political forces. July 1, 2014 – Links International Journal of Socialist Renewal -- The five seats (7.9%) won by the platform Podemos (“We Can”) in the May 25 European election was an earthquake in Spanish politics. 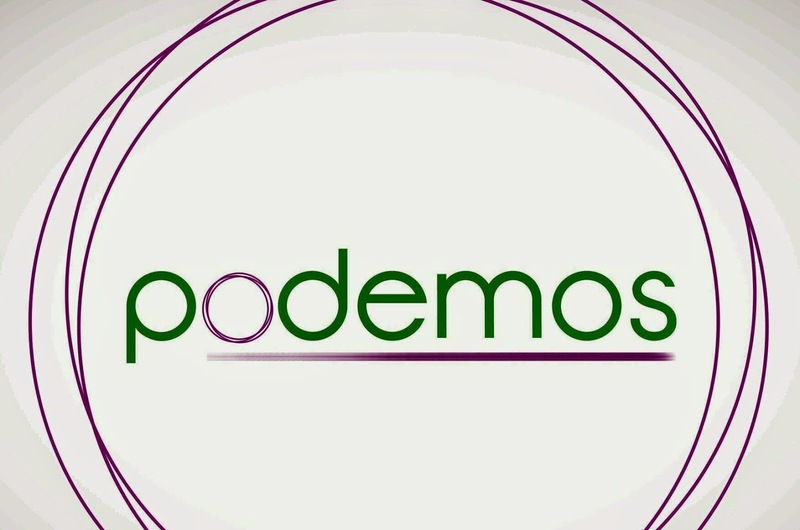 It stunned all political trends, including Podemos itself. Partido Socialista protesta contra los tratados de libre comercio europeo. 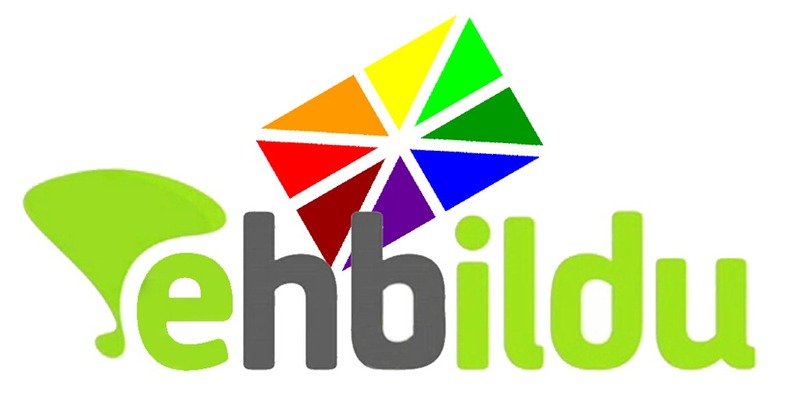 Para una mayor cobertura de las elecciones europeas de 2014, haga clic AQUÍ. Haga clic aquí para más artículos en español. Click HERE for more the 2014 European election; more on Portugal HERE. Statement by Left Bloc (Bloco de Esquerda), Portugal; translated by Federico Fuentes. June 8, 2014 – Links International Journal of Socialist Renewal, original source http://www.bloco.org/media/resomesa20140601.pdf -- Following the [September 29, 2013] local elections, the Left Bloc developed its European program via a thorough programmatic debate involving many independent activists. That culminated at our February 2014 national conference. Sinpermiso.info -- En los últimos días se ha producido un pequeño terremoto en la política irlandesa. Sinn Fein ha hecho un gran avance, convirtiéndose en una de las fuerzas políticas principales en Irlanda del sur, casi duplicando su voto hasta el 17% a nivel nacional en las municipales (y más del 20% en las elecciones europeas). Y todo ello en paralelo a un importante avance electoral de la izquierda alternativa y los independientes. En general, en las elecciones municipales en la Republica de Irlanda, que se celebraban al mismo tiempo que las europeas, el Sinn Fein ganó 150 concejales y los partidos de la izquierda alternativa, unos 40. For more coverage of the 2014 European elections, click HERE. June 6, 2014 – Links international Journal of Socialist Renewal -- The 2014 European elections were the first to have been held since the full extent of the financial and economic crisis and its consequences became apparent. Socialist Party protests against European free trade treaty. June 5, 2014 -- Rabid anti-foreigner populist Geert Wilders was expected to wipe the floor on the right; the “equally anti-EU” (according to the media image) Socialist Party (SP) would garner a protest vote large enough to put the pro-Brussels traditional left on the back foot; voter turnout would hit an historic low, itself a measure of public anger, disillusionment or disinterest. That was the consensus media guess as to likely Dutch results in the May 25 European election. By Josep Maria Antentas, translated by Federico Fuentes for Links International Journal of Socialist Renewal. First published in Spanish at Dominio Publico. More analysis of politics in the Spanish state. May 26, 2014 -- Six years have passed since the “official” start of the crisis, when Lehman Brothers collapsed in September 2008. Four years since [then president Jose Luis Rodriguez] Zapatero announced the first big package of cuts in May 2010. Three years since 15M (the May 15 Movement) exploded onto the streets. Two years since the large demonstration for independence in Catalonia on September 11, 2012. Syriza leader Alexis Tsipras (centre). Syriza outpolled all other parties in Greece. 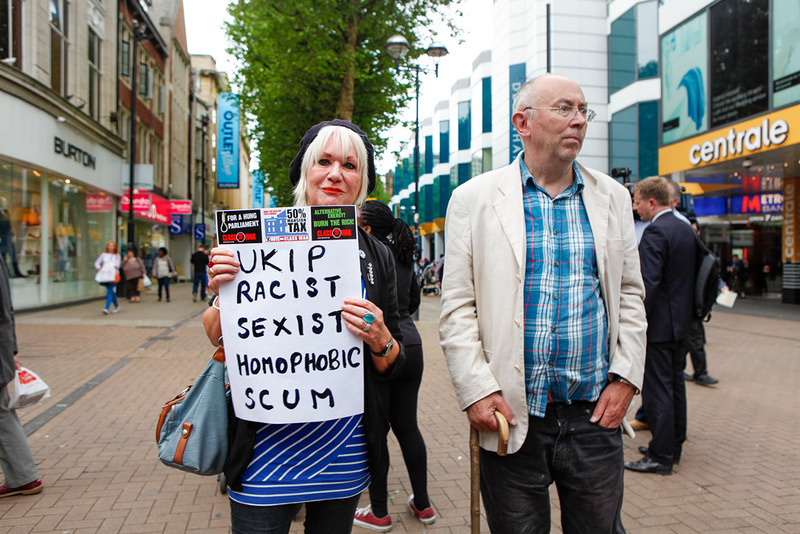 May 30, 2014 – Links International Journal of Socialist Renewal/Green Left Weekly, an earlier version of this article appeared at Green Left Weekly -- The result of the May 25 European parliamentary poll was dominated by the victories of the xenophobic and racist National Front (FN) in France (26%, 24 MEPs, Members of the European Parliament) and the United Kingdom Independence Party (UKIP) in Britain (26.8%, 24 MEPs). It has set off a wave of mainstream media angst across the old continent. May 31, 2014 -- Transform! Network -- The result of the European election in Greece must be read and interpreted under the light of the ongoing harsh austerity measures imposed by the Troika and successive Greek governments post-2009. Hence, the victory of the radical left was not particularly surprising, although undeniably historic. 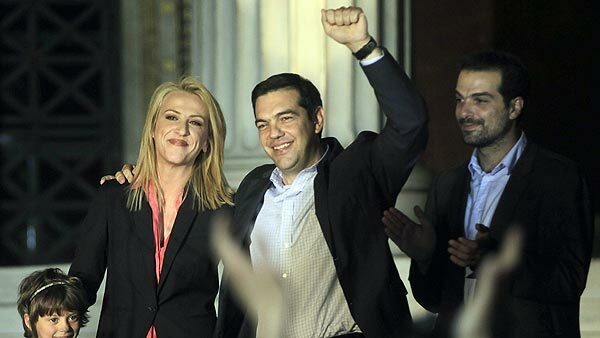 The Coalition of the Radical Left (SYRIZA) is now the biggest party in Greece having received 26.56% of the vote and winning six members of the European Parliament (MEPs), whereas the leading governmental right-wing party, New Democracy, received 22.73%. The neo-Nazi party, Golden Dawn, is now the third-biggest party in Greece (9.40%) electing three MEPs for the first time in modern Greek political history. May 26, 2014 -- Socialist Resistance -- Despite a strong support for the far right, the radical anti-austerity left maintained and increased its votes in some countries such as Greece, but also Spain and Portugal. 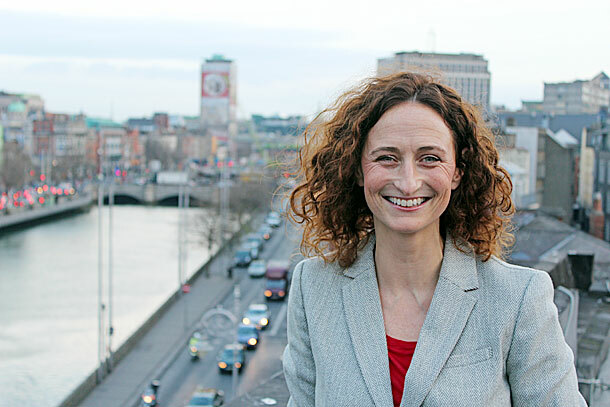 Sinn Fein's Lynn Boylan is one of the party's three MEPs in the South. 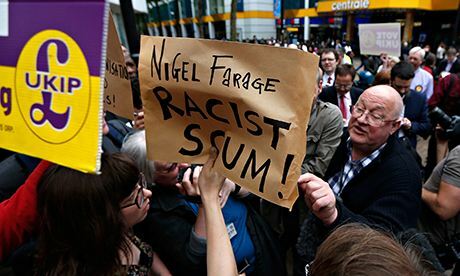 May 24, 2014 -- Socialist Resistance -- From the coverage of the English local election results and the relentless Nigel Farage mania you would think that the United Kingdom Independence Party (UKIP) had romped to first place with the Conservative Party (Tories) a close second. You’d also be forgiven for thinking that the Labour Party had received a hammering and the Liberal Democrats (Lib Dems) don’t exist. The main story in most of the press, from the BBC to the Daily Telegraph, is that Labour is in crisis as a result of the election. Yet what actually happened was that it was the two parties of Britain's coalition government -- the Tories and the Liberal Democrats -- that have been hammered. Labour’s result reflects the party’s polling figures over the last few months. It would have made them the largest party in parliament if repeated in a general election, though just short on an overall majority.